The UW web page for Quad Cherry blossoms reported "The cherry blossoms in the Quad reached peak bloom today". 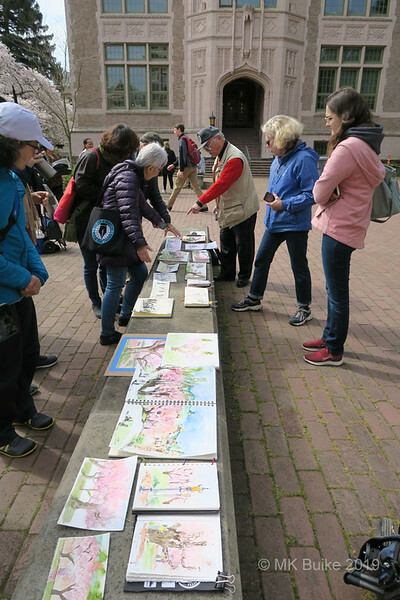 It seems Urban Sketchers Seattle hit the mark for planning a sketch outing for today. 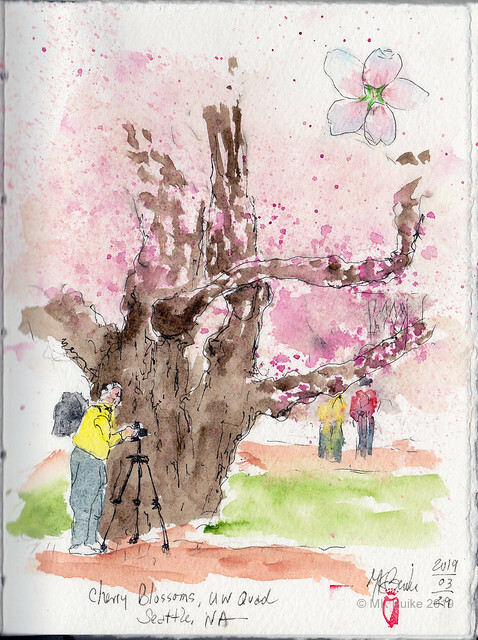 We've come to sketch the peak cherry blossoms for some years now. 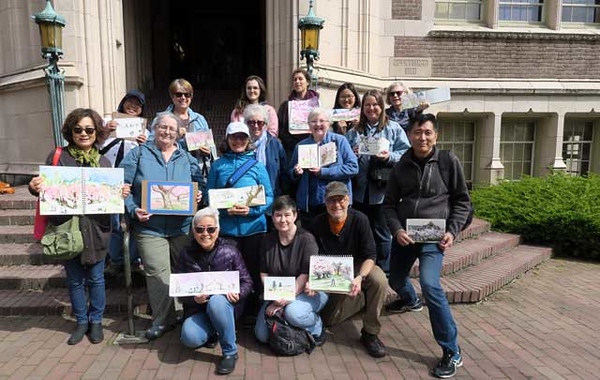 Our group photo was taken by the Ellen M. Banner, photographer for The Seattle Times. didn't get her name at the time as she was talking to us about the group and our sketches. She put one of the sketchers in her photo essay, here (it's the third image). By the end of our session there were quite a few sketchers. My first sketch of man with camera is representative of the dozens of photographers present today. The UW blossoms are predominantly white with a bit of pink in the center. But I wanted to heighten the effect with splattered pink. During this sketch I sat with two charming families, mothers with small daughters. I gave one daughter a piece of paper as she wanted to draw, too. They were picking up tiny fallen blossoms and I took one to draw in the corner of my sketch. 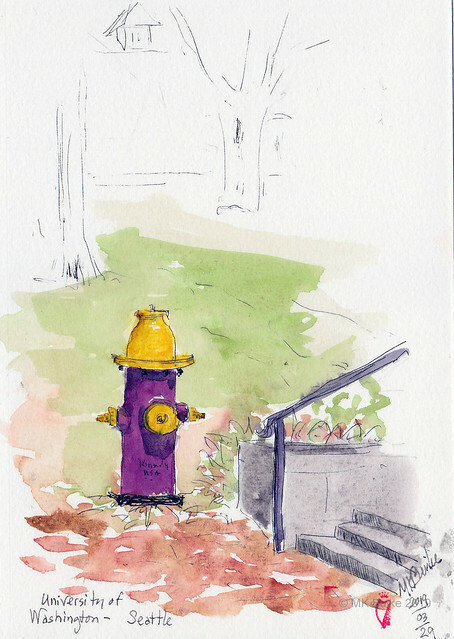 My second sketch was done for the USk Flickr group weekly theme: "fire hydrants". This one is in the colors of the University of Washington. It seemed the perfect choice. 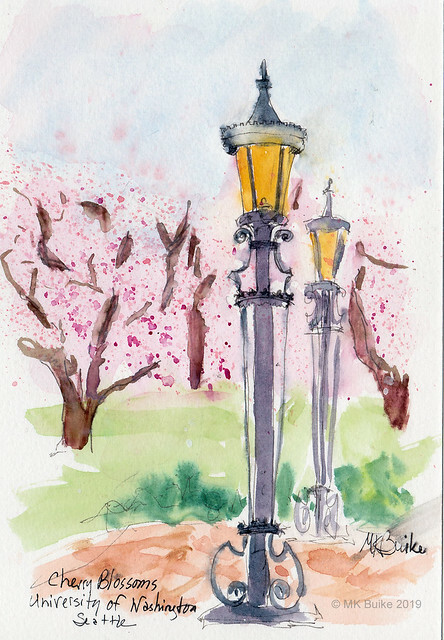 I had just a few minutes left and I wanted to include this ornate lamps in my sketch of more trees.